I've seen Walden Farms in a few places, but on my visit to High 5, this was the most recommended brand by the staff. Pretty much everyone had a favorite strain. This Grape Ape came up several times, and this team knows what's up - so I went for it! Opening the bag, there's skunky right away with a grapey-sweet undertone right behind it. There's also an ammonia component throughout the aroma. Broken down, this crisp bud's grape undertone turns into a full on fierce grape assault. It's intense, and so is the skunkiness. On the inhale, the grape is everywhere. It floods the palate and is sweet. There is a crisp, clean lemon note at the very tail end. This flavor sticks around for quite a while on the lips and tongue. Giggles onset right away, with an eye high that was instant as well. This cannabis hits with a nice mellow, a sink in your chair calming effect. The label says this clearly, and it's right. All the parts of this high are pleasant, including the spinny, rolling waves of body sensation that lead to a warm, sleepy end with super chill throughout. Overall, this product is fantastic. Aromas are intense, and flavors are even more so. The high is stupefying and calming like the label says. 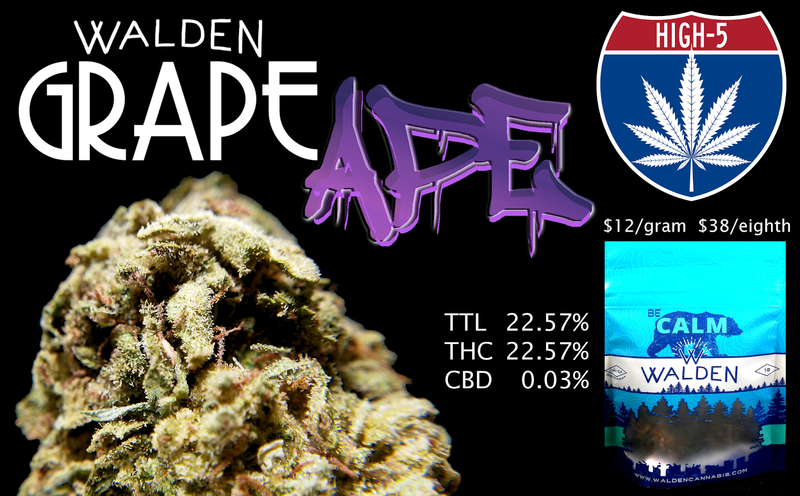 I'll be back to this brand for sure, and this Grape Ape is some nice relaxing medicine to have around.